The hotel is classified as 3 stars, it occupies six hectares and it's hidden ona park garden, bordered of a splendid beach and with a multitude of palm trees, the rooms in hotel are built in the form of "Menzel" means with a typical architecture of Djerba buildings, the hotel is entirely renovated in 2006 and it's constructed with main building and bungalows with a different amenities and services closed to your hand. The hotel offers a wide variety of sport facilities and extensive daytime activities which make it ideal for customers who like to stay super active. Hotel offers a great restaurant "dar midoun" for the residents, it offer a wide range of dishes and specialities including local and international gastronomy, a snack pizzeria "l"oasis" around the swimming pool and a barbecue in the open air with a sea view. 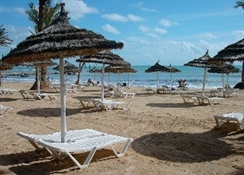 Hotel provides also 4 bars serving a wide range of drinks besides a moorish café with a terrace giving on the swimming pool. For your entertainment and leisure, hotel organises an animation programm daily and night with games, a shows, a mini club for children, also a wide range of sports such as mini golf, tennis, gym, ping pong, a large and splendid swimming pool. For your moments of relaxation hotel offers to you a massage room, a jacuzzi, sauna and beauty cares, and many other services close to your hand like shop, laundry, tv room, internet. 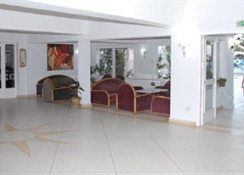 The hotel is ideally situated in the touristic zone of Aghir with just 100m of distance from the beach, the international airport of Djerba-Zarzis is away about 25 km, to join the capital of island Houmt Souk you need to drive 15 km and just 6 km to join the second main town Midoun. For Golf lovers, the superb golf course is away about 3km from the property. Hotel is made up of 212 rooms built in the local style with 162 rooms in bungalows of which 126 in the ground floor including 14 with sea view and 36 in the first floor and in the principal building we find 50 rooms of which 27 in the ground floor and 23 in the first floor. Rooms are sufficiently spacious, very clean with a typical architecture and sober furniture, they have an air-conditioning with individual adjustement, telephone, a bathroom with bathtub or shower, also a terrace or balcony to enjoy the different views (sea, garden). The nearest airport to hotel is the international one of Djerba Zarzis which is away about 25 km with an approximate driving time of 30 mn. Shuttle bus transfers can be arranged to and from the hotel, also there are some Special Taxis which can do direct transfers from the airport to the hotel.